Students of all levels are welcome from beginners to advanced competitors and professionals. We take pride in giving personal attention to the needs of each individual, with instruction tailored to fit your present level, short and long-term goals, and desired level of commitment to the learning process. Our emphasis is on dressage and combined training based in a sound foundation of classical training and balance seat riding. We also specialized in flatwork for hunter equitation riders. “Your Own Schedule” Package lessons may be scheduled one at a time and appointments may be changed as needed, with at least 2 hours notice. Missed appointments will be charged against the package. Packages may be shared by members of the same family. No time limit on package use. 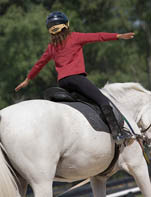 Riders who are at least Pink Level may schedule practice rides on HFI horses. Rides must be scheduled in advance. Horse assignments are made by HFI staff, with rider preferences taken into account. We can do PERSONALIZED GIFT CERTIFICATES for birthdays, Christmas, anniversaries, graduations, and other special events. 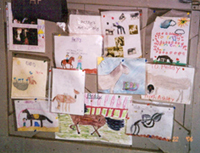 We have brought many horses and riders local, regional, and national acclaim over the past 25 years. Honors include Horse of the Year Awards and rider medals for the Wisconsin Dressage and Combined Training Association, United States Equestrian Federation, and United States Dressage Federation. We are proud of the success of our students over the years and are pleased to provide intensive training for competition for those with high aspirations. We also occasionally have a top quality show horse for lease to a qualified student. You are invited to visit us to watch and instruction or training session and to discuss your competition goals. We would be happy to design a program suited to your needs, means, and objectives, whether it is to win your first ribbon or be part of an international team. As an FEI International judge since 1989, Jayne Ayers has the knowledge and experience to help you put the finishing touches on your test riding. Bring your horse and even your regular coach to Hearthstone Farm to ride your tests in our regulation size dressage ring, simulating horse show conditions. We offer guided review of both test sheets and videos, along with the tips that produce winners. Get the judge's view before the show! Prices vary by services requested.